Choose the image you would like to recreate with sequins. For some free clipart and image ideas click here. Once you have chosen your image, purchase your sequins in colors to suit, and acrylic paint in colors to match your sequins. Give your canvas an undercoat using your paint. Paint it evenly all over, using the background color of your design. Allow paint to dry. Print out the image you are using onto paper, printing to the size that you want it to be on your canvas. Cut off excess paper around your image then turn it over and scribble all over with your pencil, covering the entire reverse side of the image in the lead. Once your undercoat on the canvas has dried, place your image on top of it, in position, with the lead side in contact with the surface of the canvas. Hold it in position while you trace around the important lines of your image. This will transfer the lead onto your canvas for an exact copy. Using your paint, fill in the areas with the appropriate colored paint. 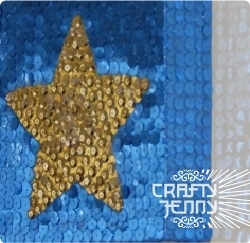 This is so that if you leave any gaps between the sequins later, it will still look nice with the matching color showing through. Allow paint to dry.